Body awareness involves attentive focus on, and awareness of, internal body sensations, and this has been found low among persons with eating disorders (EDs). Body unawareness can lead to the development of body dissatisfaction, the highest and most robust risk factor related to ED, and therefore, the promotion of body awareness is of particular importance in therapy. Yoga cultivates a direct experience of the body, which may be particularly effective in increasing body awareness to counteract body dissatisfaction and development of ED.,, Encouraging evidence has emerged regarding the therapeutic potential of yoga in ED treatment ,, by reducing binge eating and food preoccupation, increasing awareness of binge eating triggers, and using of yoga techniques as an affect regulator. To the best of our knowledge, there are no publications concerning the effects of yoga in treatment of the EDs such as bulimia nervosa (BN) or ED not otherwise specified (EDNOS) in an adult population. One of the existing studies has follow-up, but this is limited to 1 month after the intervention. The aim of this study was therefore to examine the effect of yoga in the treatment of ED. The research hypothesis was that ED psychopathology would decrease over time in a sample of adult females with BN or EDNOS who received yoga treatment, compared to controls. Participants in the study were recruited through advertisements at hospitals, physicians, and the University of Oslo and through letters to members of a nonprofit interest organization for ED (www.iks.no). Inclusion criteria were female, age ≥18 years, the Diagnostic and Statistical Manual-IV diagnosis of BN or EDNOS, and no previous experience with yoga. Exclusion criteria were body mass index ≤17.5 and psychotic disorders. A total of 38 females volunteered to participate [Figure 1]. Due to the expected higher dropout rate in the yoga group, we used a randomized 2:1 block design. The randomization was carried out with concealed allocation through sealed envelopes after the pretest. Six of the participants were receiving psychotherapy during the intervention period; these were stratified into a yoga group (n = 4) and a control group (n = 2). There were no differences between the two groups at baseline [Table 1]. Only one participant in the intervention group and one in the control group were on anxiety-related medications, anxiolytikum, at baseline. The study was approved by the Regional Committee for Medical and Health Research Ethics in Southern Norway and by the Norwegian Social Science Data Services and registered in clinicaltrials.gov (NCT00870753). The participants received written information about the study, and they gave written consent for participation. The design of the study was a randomized controlled single-blinded trial. The intervention group received 90-min of Hatha yoga led by an experienced and educated yoga teacher ( first author) two times per week for 11 weeks. The class started with relaxation with awareness of the body, followed by different physical exercises, breathing exercises, and concentration meditation, and at the end a longer relaxation. The participants were educated about the philosophy of yoga – that this was a noncompetitive form of activity and that they needed to be aware of their individual physical and mental limits in the exercises performed. To counteract the possible group process effects bias, they were instructed to have no contact with each other during and between classes. The participants were encouraged to practice yoga at home, and they therefore received written information and illustration about different yoga positions. The control group was instructed not to perform yoga during the intervention and follow-up period, but they were offered yoga classes after the 6-month follow-up period. To eliminate the group effect of the yoga intervention, the control group was offered two 90-min group meetings covering the aspects of nutrition, physical activity, and ED. An experienced professional in these areas (third author) led these meetings. The main outcome variable was the Eating Disorders Examination (EDE)- Interview global score. It also includes four subscales: restraint, eating concern, weight concern, and shape concern. The EDE has been shown to have a good internal consistency for each subscale and test–retest reliability and inter-rater reliability., The EDE-Interview was carried out by a highly trained and experienced psychologist (second author) who was blinded to the participants' group allocation. 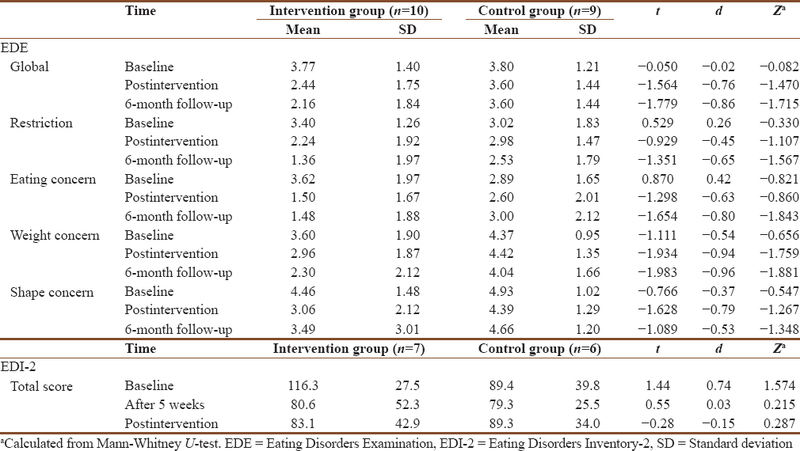 The secondary outcome variable was the Eating Disorders Inventory (EDI-2). This is a 91-item self-report questionnaire used to assess the presence of ED symptomatology. A Danish validity study shows an internal consistency measured by Cronbach's alpha higher than 70. The statistical analyses were performed using the software IBM SPSS Statistics for Windows, Version 24.0. (Armonk, NY: IBM Corp.). To analyze the effects of the yoga intervention, mixed-design analysis of variance (ANOVA) was used. Two main effects (of group and time) and one interaction effect (group by time) were estimated and tested for significance in this analysis. Student's t-test was used to examine the differences in mean scores between the intervention and the control groups on each measure point. The effect size for this difference between the two groups was calculated using Cohen's d-value. To test the robustness of the findings, additional nonparametric analyses were conducted. Mann–Whitney U-test was applied to examine the differences in median score between the two groups at each time of measurement. Since there are no nonparametric alternatives to mixed-design ANOVA, the development in EDE and EDI scores over time was examined separately within each group using the Friedman rank test for k correlated samples. The dropout rate from the study was 30% at posttest and 37% at 6-month follow-up. The mean attendance rate in the intervention group was 13.75 of 21 sessions. No adverse events of the yoga were observed by the instructor or reported by the participants. Two-way ANOVAs showed significant interaction effects for group by time on EDE global (F2,16 = 5.49, P < 0.01), on restriction (F1,16 = 3.83, P ≤ 0.05), and on eating concern (F1,16 = 6.40, P ≤ 0.01), meaning the decline in EDE scores over time was larger within the intervention group compared to the control group. No significant interaction effects for group by time were found for weight concern and shape concern. The difference between the two groups on mean EDE global was found to be largest at 6-month follow-up [Table 2]. The Friedman rank test showed a decline in EDE global (χ2 = 10.4, P < 0.01), restriction (χ2 = 10.2, P < 0.01), eating concern (χ2 = 8.90, P < 0.05), and weight concern (χ2 = 6.16, P < 0.05) within the intervention group but not within the control group (χ2 = 0.41, P = 0.841; χ2 = 1.40, P = 0.497; χ2 = 1.24, P = 0.539; and χ2 = 1.09, P = 0.581, respectively). No change in rank scores on shape concern was found within the two groups. No interaction effect for group by time on global EDI-2 scores was found. The Friedman test found no change in global EDI-2 rank scores in either group. The results demonstrated favorable ED psychopathology outcomes for the yoga group over time. The persistence of the results 6 months after the intervention period is interesting and meaningful, given the extensiveness of the yoga intervention. The significant results from the restriction and eating concern subscales appear responsible for the overall pattern of findings in the EDE global, more so than the shape and weight concern subscales. It is possible that yoga contributed to a deeper contact with the body, which in turn contributed to a regulation and toleration that decreased the symptoms in the restriction and the eating concern subscales. The shape and weight subscales are related to bodily experience. It takes more time to change the experience of the body as this is linked to personality rather than symptoms. A longer intervention period might have provided a change in bodily experience. Compared to Carei et al., our study found different results regarding EDE global. A possible explanation for the differences is that our participants received yoga in groups, while the participants in Carei et al. used yoga individually. Our results can therefore be due to the group process, and the experience of group cohesion could be a factor contributing to the results seen in this study. Although Vini and Hatha yoga are comparable, they might affect ED psychopathology differently. In addition, our study had longer and more frequent sessions and a longer intervention period. The studies also differed in age groups (adults vs. adolescents) and ED diagnoses. Carei et al. included persons with anorexia nervosa (AN), who might differ from persons with BN and EDNOS regarding motivation for treatment and resistance against treatment. Persons with BN are possibly more motivated to change because they experience more of a suffering from the illness compared to persons with AN. The analysis of ED psychopathology measured by EDI-2 shows no interaction between group and time. This could be because EDI-2 is divided into two main indexes: symptom and personality. It might be that this study captured the personality indexes, which may be more rigid and more resistant to change. EDE measures the ED symptoms only. We therefore did an analysis of the symptom index of the EDI-2 to see if it correlates with EDE. The analysis did not show any differences between the groups. Differences could also be due to the methodology. A survey demonstrates a combination of high sensitivity and lower specificity that would explain the increased prevalence of symptoms when assessed by self-report versus interview. Self-report assessments such as EDI-2 are not necessarily inferior to interview assessments such as EDE, but the two methods may reveal different aspects of the ED. Findings support the possibility that increased rates of ED psychopathology on self-report assessments compared to interview assessments may partly be due to increased candor when participants feel more anonymous. The strengths of this study are the use of randomization, the use of gold standard ED assessment with blinded assessor, and controlling for possible group effects by letting the control group meet and give relevant theoretical lectures. It is possible that the latter offer was too limited to produce any effect in the control group compared to the intervention group. Limitations of the study are the small sample size which increases chance of type II error and the high dropout rate, although the rate is comparable to dropout rates in other ED treatment studies. Dropout analyses showed no differences between the dropouts and the completers. Other factors such as the receiving of psychotherapy and repetitive testing could have contributed to the results. Future studies should compare yoga in individual and group treatment to accommodate for the group effect. The different elements of yoga (relaxation, physical movement, breathing, and meditation) should be explored to extract the specific therapeutic effects. Yoga should be compared with psychotherapy, and possible complementary effects of yoga in psychotherapeutic treatment need to be examined. 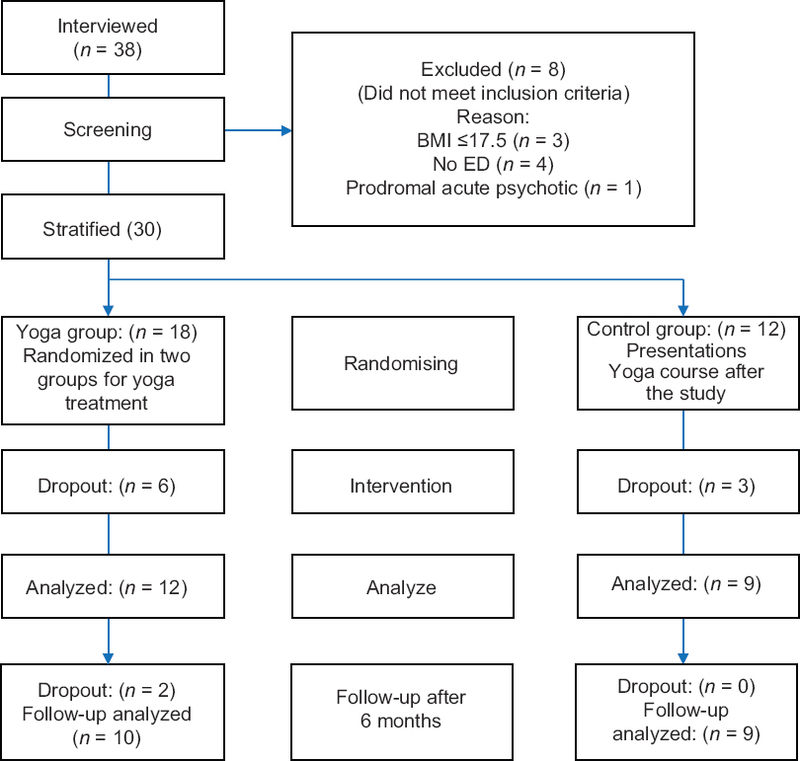 The present study showed reductions in ED psychopathology following yoga treatment at posttest and at 6-month follow-up. Yoga may therefore be beneficial in ED treatment. McIver S, O'Halloran P, McGartland M. Yoga as a treatment for binge eating disorder: A preliminary study. Complement Ther Med 2009;17:196-202. Fairburn C, Cooper Z, O'Connor M. The Eating Disorder Examination (16.0D). In: Fairburn C, editor. Cognitive Behavior Therapy and Eating Disorders. New York: Guilford Press; 2008.